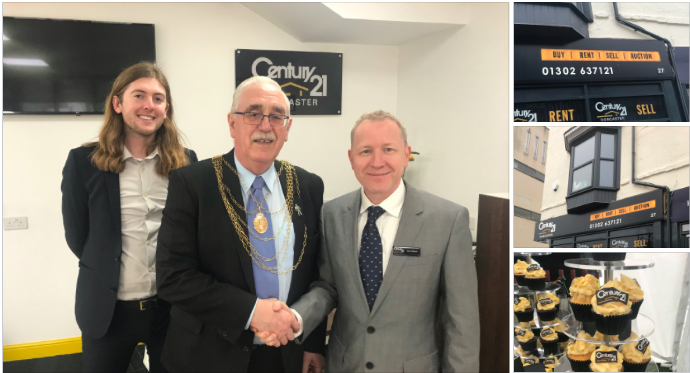 Estate agency and lettings franchise, CENTURY 21 UK, celebrated the opening of its new franchise in Doncaster with an opening event and the help of the local Mayor. The event, which took place on Wednesday 11th April 2018, showcased the new office which is based in central Doncaster’s Waterdale. The office will be home to a brand new team which will serve not only Doncaster but also Rotherham and the surrounding areas. Franchisee owner, Macauley Gibbs, who at just 23 has established and immersed himself within the property industry by previously running his own local lettings agency before becoming a CENTURY 21 UK franchisee. In addition to this, Macauley is also a landlord and therefore understands exactly what clients are looking for in their agent. Chris Summers, head of sales and development for CENTURY 21 UK comments: “The opening of our new branch in Doncaster is further evidence of CENTURY 21 UK’s outstanding growth in the last two years with a further 14 offices due to open in the next four months.